Ujjain is the modern name for Ujjayini. 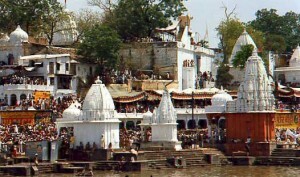 Modern Ujjain is situated on the banks of the river Krishpra in Madhya Pradesh, regarded since times immemorial as sacred. The name of Kalidasa and Ujjayini are inextricably linked together in the Indian traditions. It is in Meghdoot, a poem of a little over hundred verses, describing the anguish of a yaksha, separated from his beloved by a curse, sending a message to her in the city of Alaka through a rain cloud from his exile in Ramagiri(now identified as Ramtek near Nagpur) that Kalidasa’s love of Ujjayini finds full expression. Air: Nearest airport is Indore 53 km. Rail: Ujjain a station on the Western Rly, is linked with all the major places in India as Indore. Road: Good motorable roads and regular bus services connects Ujjain with Indore, Bhopal, Gwalior, Khajuraho 570 km, Ahmedabad 402 km, Mumbai and Delhi. 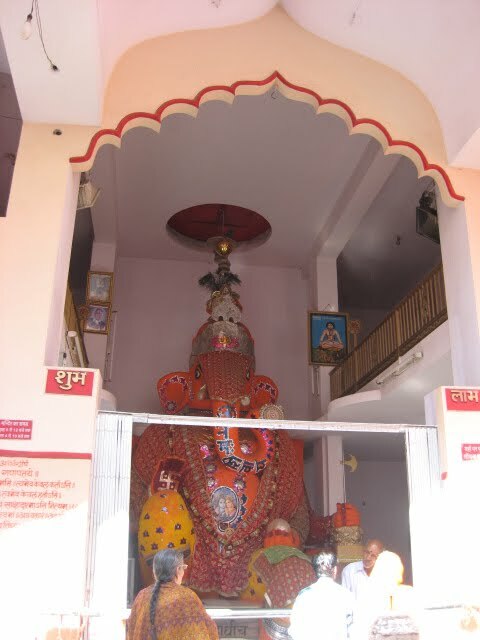 Bada Ganpati Mandir : This temple situated above the tank near the Mahakaleshwar temple, enshrines a huge artistic sculpture of Ganesh, the son of Shiva. An idol of this size and beauty is rarely to be found. 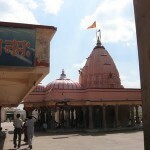 The middle of the temple is adorned by an idol of the pancha-mukhi (five faced) Hanuman. There is provision for learning of Sanskrit and Astrology in the temple. Pir Matsyendranath: This is an extremely attractive spot on the banks of the Krishpra quite close to the Bhartihari Caves and the Gadkalika Temple. It is dedicated to the memory of one of the great leaders of the Natha sect of Saivism – Matsyendranath. Since Muslims as well as the followers of the Natha sect call their saints ‘pir’, both venerate the ancient site of Pir Matsyendranath. Excavations at this site have yielded some antiquities which datte back to the 6th and 7th century BC. Bhartrihari Caves: These caves are situated just above the bank of the Krishpra near the temple of Gadkalika. 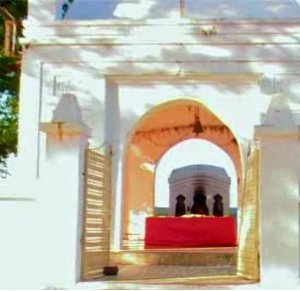 According to popular tradition, this is the spot where Bhartrihari, who is said to have been the stepbrother of Vikramaditya, lived and meditated after renouncing worldly life. He is believed to have been a great scholar and poet. Kaliadeh Palace: Situated on the banks of the Krishpra, the island-like site immediately conjures up the natural beauty of ancient Ujjain which poets down the ages have waxed lyrical. The glorious landscape of the flowing river on both sides of the palace and the man-made tanks and channels, with water gurgling through them, provide a spectacular backdrop to the imposing building. The central dome of the palace is a beautiful example of Persian architecture. Two Persian inscriptions found in one of the long corridors of the palace record the visits of Emperor Akbar and Jehangir to this palace. Durgadas Ki Chhatri: This distinctive monuments glow like a small jewel in the surrounding lush landscape. Veer Durgadas earned a secure niche for himself in the history of Marwad by his undoubting selfless service to the State. This beautiful structure, built in the Rajpur style of architecture, houses a statue of Durgadas that crumbled down. 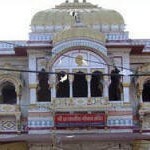 Harsiddhi Temple: This temple occupies a special place in the galaxy of ancient sacred spots of Ujjain. Seated between the idols of Mahalaxmi and Mahasaraswati, the idol of Annapurna is painted in dark vermilion colour. The Sri Yantra, the symbol of power or Shakti, is also enshrined in the temple. The temple was reconstructed during the Maratha period and the two pillars adorned with lamps are special features of Maratha art. These lamps lit during Navaratri, present a glorious spectacle. There is an ancient well in the premises, and an artistic pillar adorns the top of it. 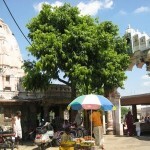 Siddhavat: This enormous banyan tree on the banks of the Krishpra, has been vested with religious sanctity as the Akashyavat in Pryag and Gaya, Vanshivat of Vrindavan and the Panchavat of Nasik. 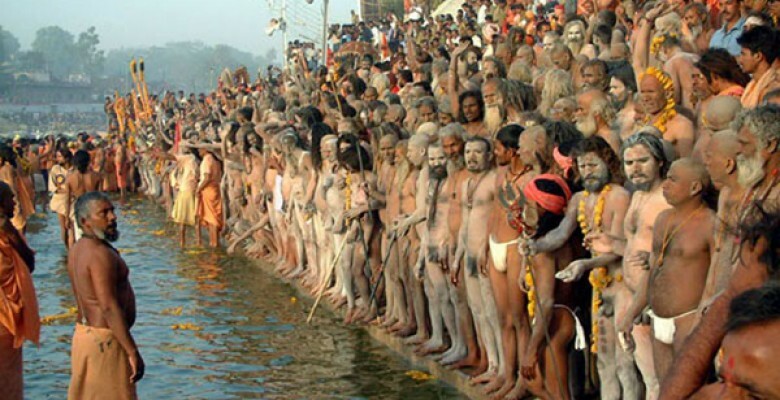 Thousands of pilgrims take a dip in the Krishpra from the bathing ghat built here. Kal Bhairava: The worship of the eight Bhairavas is a part of Saivite tradition and the chief among them is Kal Bhairava, believed to have been built by King Bhadresen, on the banks of the Krishpra. Ujjain was prominent centre of these two sects. Even today, liquor is offered as a part of the ritual to Kal Bhairava. Beautiful paintings in the Malwa style once decorated the temple walls, only traces of which are visible. 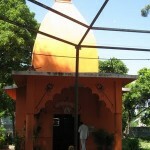 Sandipani Ashram: The fact that ancient Ujjain apart from its political and religious importance, enjoyed the reputation of being a great seat of learning as early as the Mahabharata period is borne out by the fact that, Lord Krishna and Sudama received regular instructions in the ashram of Guru Sandipani. 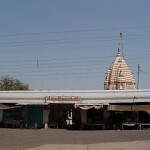 The area near the ashram is known as Ankapata, popularly believed to have been the place used by Lord Krishna for washing his writing tablet. The numeral 1 to 100 found on a stone is believed to have been engraved by guru Sandipani. An image of Nandi, belonging to the Shunga period, is to be found near the tank. 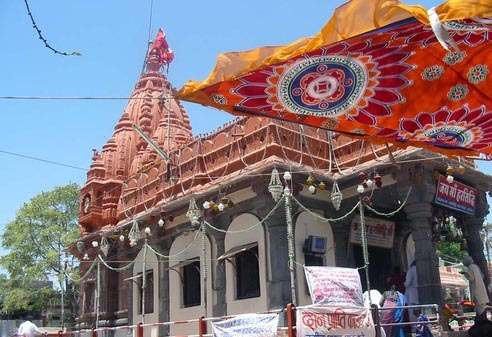 Gadkalika: Situated about 2 miles from the city of Ujjain, the deity in this temple is believed to have been worshipped by Kalidasa. Emperor Harshavardhan had this temple renovated in the 7th century AD. 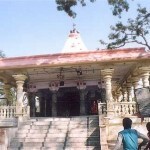 The temple has been rebuilt in the modern times by erstwhile Gwalior State. 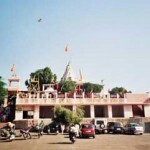 Mangalnath Temple: This temple is situated away from the bustle of the city and can be reached through a winding road. The temple looks upon a vast expanse of the Krishpra waters and fills the onlooker with an indescribable sense of peace. Mahadev or Shiva is the deity that is worshipped in the temple of Mangalnath. 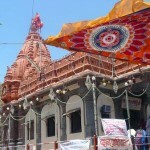 Gopal Mandir: This huge temple is situated in the middle of the big market square. Bayajibai Shinde, the queen of Maharaja Daulat Rao Shinde in the 19th century, constructed it. It is a beautiful example of Maratha architecture. The sanctum sanctorum is inlaid with marble and doors are silver-plated. Navagraha Mandir (Thriveni): Situated on the Triveni Ghat of the Krishpra, the temple is located away from the old site of Ujjaini town. It is dedicated to the nine planets, attracts large crowds on new moon days falling on Saturdays. Mahakaleshwar: The presiding deity of time, Shiva, in all his splendour reigns eternal in Ujjain. 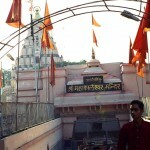 The temple of Mahakaleshwar, its shikhara soaring into the skies, evokes primordial awe and reverence with its majesty. The VedaShala (Observatory): Ujjain enjoyed a position of considerable importance in the field of astronomy. There is a small planetarium and a telescope to observe the moon, Mars, Jupiter and their satellites. The observatory is also used for weather forecasts. Vikram Kirti Mandir: Established on the occasion of the second millennium of the Vikram era, as the cultural centre to perpetuate the memory of Vikramaditya, the Vikram Kirti Mandir houses the Scindia Oriental Research Institute, an archaeological museum, an art gallery and an auditorium. The Scindia Oriental Research Institute has an invaluable collection of 18,000 manuscripts on various subjects and runs a, reference library of important oriental publications. Rare manuscripts in Prakrit, Arbaic, Persian and other Indian languages cover a wide range of subjects from Vedic literature and philosophy to dance and music. Palm leaf and bark leaf manuscripts are also preserved in this institute. The museum also exhibits a rich array of images, inscriptions, copper plates and fossils discovered in the Narmada valley. A huge skull of a primitive elephant is of special interest. 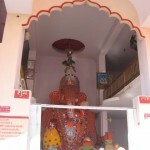 This entry was posted in Madhya Pradesh, Ujjain and tagged Bada Ganpati Mandir, Bade Ganesh Ka Mandir, Bhartrihari Caves, Chintaman Ganesh, Durgadas Ki Chhatri, Gadkalika, Gopal Mandir, Harsiddhi Temple, Kal Bhairava, Kaliadeh Palace, mahakal ujjain, Mahakaleshwar temple, Mangalnath, Manglanath Temple, Navagraha Mandir, Pir Matsyendranath, Sandipani Ashram, Siddhavat, The Veda Shala, The VedaShala, ujjain temple, ujjain temples, Vikram Kirti Mandir. Bookmark the permalink.